These are the results for 2014 Multivitamin ratings. To see the latest information, please go to the current multivitamin ratings. Health supplements can help you maintain a healthy lifestyle. We’ve compared several multivitamin brands to help you choose the right product for your needs. Canstar Blue research finalised in December 2014, published in January 2015. Three quarters of the respondents to our most recent survey reportedly feel better when they regularly take a multivitamin – quite the glowing endorsement for the petite pill. While the energy boost is a significant incentive to make the purchase (according to 1 in 5 Kiwis), a greater number of respondents (2 in 5) purchase because of the perceived health benefits. And what’s the price for this peace of mind? The average our respondents pay for their multivitamins is $24.70. Multivitamins are certainly a highly sought after commodity by New Zealanders, but picking a brand can be tricky. A trip down to your local pharmacy will reveal a wall of choices in many cases, which can lead to a real headache*. range of packaging sizes available. 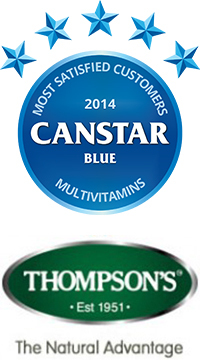 In fact, Thompson’s received more five star ratings in this category than any other rated brand. In short, this brand are quite deserving of our Most Satisfied Customers Award – Multivitamins. Red Seal, five star recipient for multivitamin effectiveness, taste, and availability. Healtheries, who achieved five stars for value for money. Centrum, a top rated brand for its multivitamins availability. * We feel compelled to disclaim, ‘Being spoilt for choice’ has not been linked to headaches by any meaningful medical research. Canstar Blue commissions Colmar Brunton using the SSI panel to regularly survey 2,500 New Zealand consumers across a range of categories to measure and track customer satisfaction. The outcomes reported are the results from customers within the survey group who have purchased and consumed multivitamins in the last 12 months – in this case, 1,035 New Zealanders.